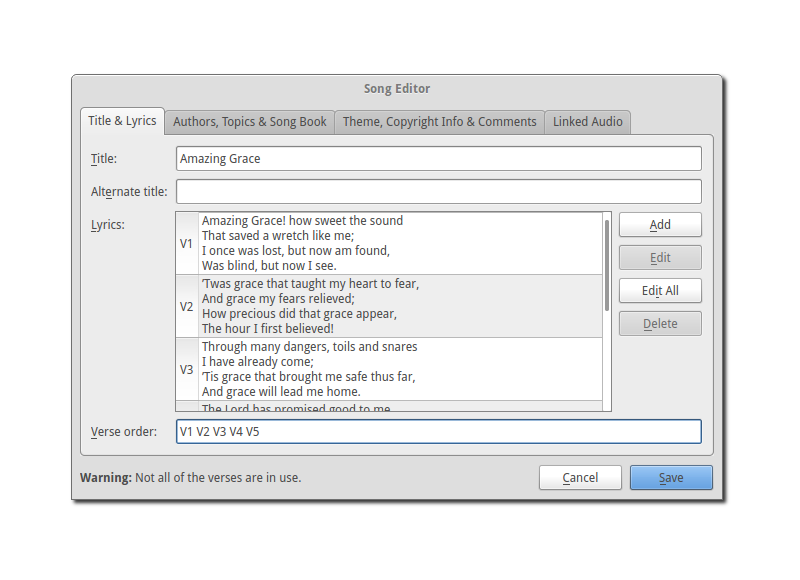 Free Worship Presentation Software for your Church. OpenLP is a feature rich open-source church presentation platform that doesn't tie you down to subscription renewals, device platforms, or even the presentation computer! With OpenLP, you're free to upgrade as soon as the next release comes out; you're free to roam the sanctuary with one of our remote apps, and you're free to install as many copies of the application as you want on Windows, Linux, Mac or FreeBSD. OpenLP continuously strives to deliver with excellence the technical elements of your church's worship service. 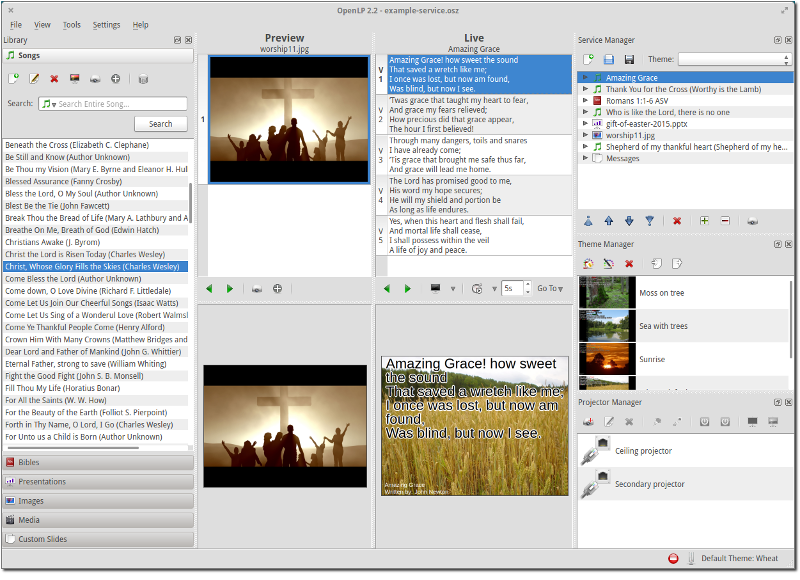 OpenLP is an open-source presentation platform created for use in churches large and small. 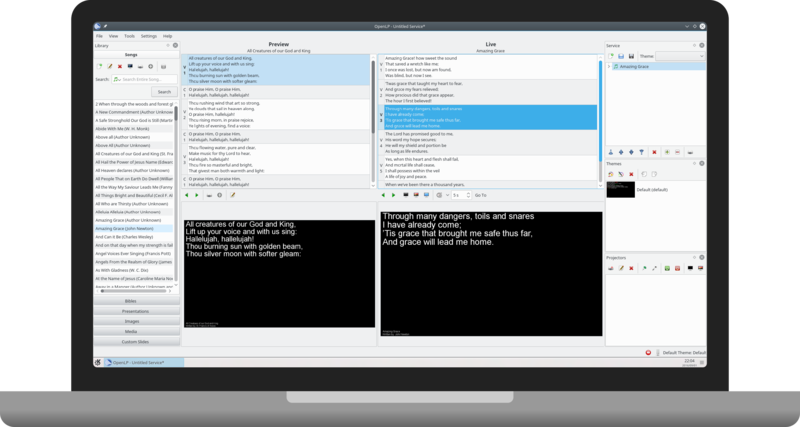 Say good-bye to the hassle of subscription costs and device platforms; this software offers a wide variety of features that will greatly benefit your worship service. But what does open-source mean? It means that the code that the developers write is available to you. But more than that, it means that OpenLP is, and always will be, free. Free to download, free to use, and free to give to all your friends. Being open-source also means that the developers are continuously working to improve this application, and welcome any comments or questions users may have. Import songs from a variety of sources, tag verse types, set ordering of verses, add formatting, manage authors, search through songs and even add backing tracks to songs for when your band is on holiday. Control OpenLP remotely using any tablet or phone using our remote apps in the Google Play Store and Apple App Store. Search, go live, control slides, and more. Also accessible via any phone's web browser. Import pictures into OpenLP and organise them into folders. Create slide-shows by simply selecting multiple songs and drag-and-dropping the selection into the service, with auto-forwarding. Select your operating system, and then click on the link below the selector to download OpenLP for your platform. OpenLP only supports Canonical-supported versions of Ubuntu from 16.04 and up. Note: OpenLP only supports the most recent Fedora release. Note: OpenLP only supports Debian unstable. OpenLP is available in the Arch User Repository. You will need to install an AUR helper if you haven't already. Older versions can be downloaded from our downloads archive, but we do not support these versions. At our Bible college, we decided to switch to OpenLP because it was free. We found it to be feature-rich and easy to use. It's also constantly improving. Hello, I love your software! Praise the Lord. The fact that you all are willing to provide this for free is amazing. OpenLP has made a tremendous positive impact on our services. The singing has increased tenfold as even those with poor eyesight can clearly see the onscreen lyrics. I have been using OpenLP for a couple of years and I found it very easy to navigate and despite never having used this type of software before was able to get a service up and running in a couple of minutes once I had installed the program. Just wanted to drop you a line to say thank you for a great product. I'm traveling around to small churches helping them upgrade their media environments. With little or no budgets, OpenLP has been a great help. I wish I could capture the look on a pastor's face when I tell him it's a free software. Sunday morning I set the up projector, gave a 10 minute lesson to the young lady who does our overheads. Everything went smoothly. She was so excited, the congregation thought it was great, our priest was ecstatic. The best place to learn how to use OpenLP is the Manual, which has both Frequently Asked Questions and a Troubleshooting Guide. If you are unable to find the answer in the manual, browse the Forums where a number of folks in our community can help to answer your questions. OpenLP is not developed by a company, but by a group of volunteers who dedicate part of their spare time to developing this application. These same developers try to also find time to help users with their problems. Every moment a developer spends on answering a question is a moment not spent working on OpenLP. Please use their time sparingly.